What better way to cap off another week than a before & after? I was going through my iPhone photo gallery last weekend and found some "before" pictures of my master bedroom that I have never shared. Now's the time, my friends. 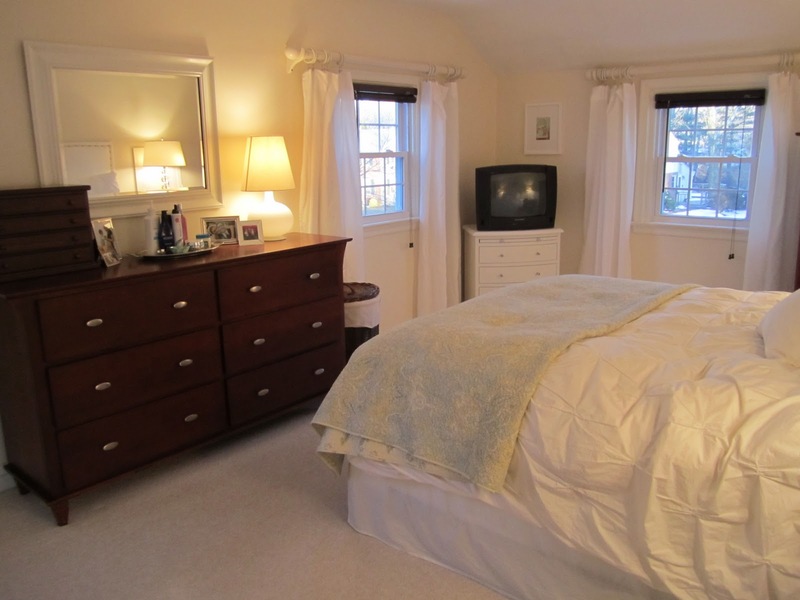 I am almost embarrassed at the sad, sorry state that my master bedroom used to be in. I made a lot of poor choices that somehow spiraled into a room that I just didn't like. I lived with it far too long before changing into the room that I have, and love, now. Without further ado, here are the instant gratification before and afters. Before: you can see the taupe damask duvet cover that I had on the bed. This replaced the ivory and taupe with very subtle lavender flowers (Calvin Klein) that we registered for in 2003 when we got married. That duvet, sadly, could not survive two kids and one cat. So I went neutral thinking it would be just great. 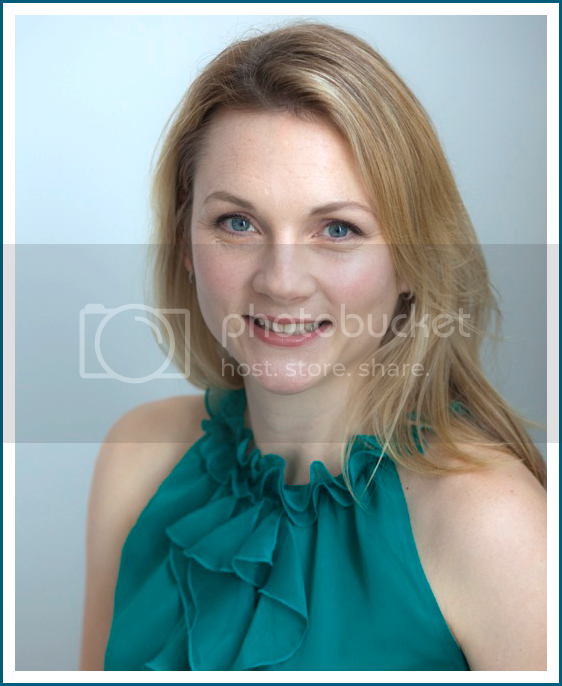 But instead, it looks shabby and sad and washed out next to all the creams in the space. Note the lack of headboard, too. And the random dark purple pillow that kind of used to work when the duvet had a hint of purple. I also had a family picture hanging near the door. Odd. After: Different angle, but you get the drift. I kept the furniture and lamps because I do like them. 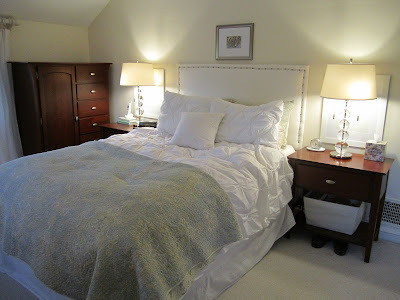 I got rid of the bedding and brought in the white pintuck bedding from West Elm that I coveted as soon as I saw it. I *love* this bedding. I bought the soft green and blue printed coverlet & shams at Home Goods for about $25, just to bring in a little punch of color. I made the upholstered headboard in a few hours. The art over the bed is simply a framed print from Etsy, and I framed some gorgeous paper that I found at Paper-Source and popped them in oversized white frames and put those behind the nightstands. I never would have thought of doing that, but saw Sarah Richardson did it in one of her houses, and totally stole the idea. Before: It doesn't get any better. I found these dark purple curtains and they matched the pillow perfectly! I don't know why that was a selling point but in 2005, it totally was. I had white mini blinds covering the windows, which certainly did not help matters. The dresser had a bunch of clutter on top and look at that - the clutter went on the floor too. 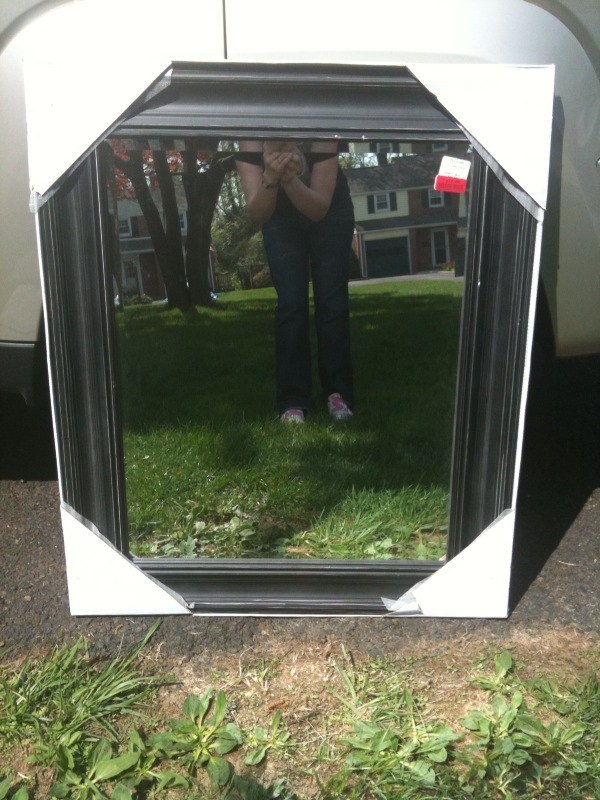 I found the mirror over the dresser at Wal-Mart for about $20. I loved it, and I still do, but it's too small for the space [note: I've saved this and will paint it pink for Little's room]. In the corner along that same wall, the TV stand was just a little chest we got when we bought our bedroom set. And I had two random pictures in the corner of that room: one was a baby picture of my son and the other was a wedding gift: a framed wedding invitation that was a nice thought but not really my style. 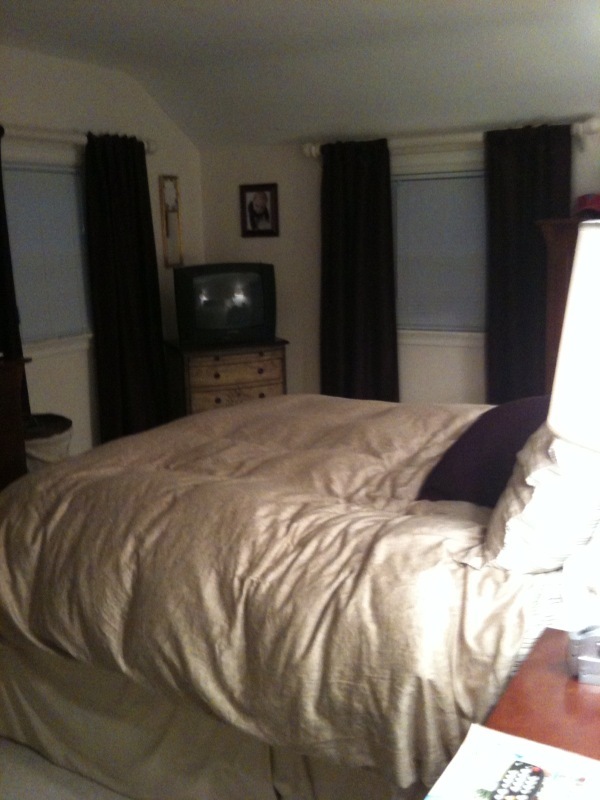 After: from dark and dingy to light and bright. I cleared out the clutter first and foremost. Then I painted the TV cabinet white, which brightens up that corner. I ditched the purple heavy drapes and brought in white panels from IKEA ($10 for two!) which I hemmed with the no-sew fusible tape. I also got rid of the white mini blinds and brought in these faux wood thick blinds from Target. One of my favorite transformations was the mirror. I could not find a large white mirror I liked so I went the DIY route. I found the big rectangular mirror on clearance at Marshalls for $13! I used primer and paint and turned it from black to white. Doesn't it look good? I have a picture of the mirror in its before state (note the little red clearance sticker, which always makes my heart skip a beat). Ahh. I really do love my bedroom now. And the transformation was due to new linens, a headboard, new window treatments (that cost next to nothing), some white paint and decluttering. I didn't even paint the walls! 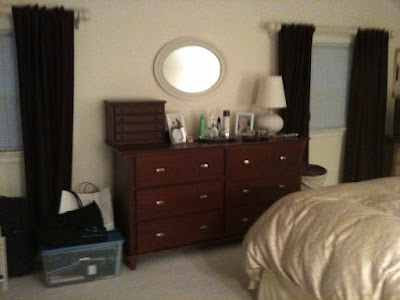 Talk to me about your bedroom: it is your sanctuary or is it something else? PS: Want to post a comment but are having trouble doing so? Click here to find out how. 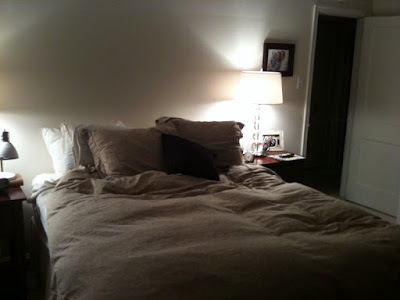 I seriously *heart* that West Elm bedding! What a huge difference! I have the West Elm bedding and you are right, it is divine. Who doesn't love a built in?